PassPACES | Pass your MRCP PACES! Attention- !! - 4th Edition ! -Last 20 copies-Now at US59.99! Go to download area to view sample pages of fourth edition! If you are struggling to pass your MRCP PACES, this will be the most important letter you will ever read!
" I thought I will fail my MRCP PACES until I read this ebook and now I know that everyone can pass their MRCP PACES if they know the strategies"
Discover how you can pass your MRCP PACES confidently in just ONE Attempt! Are you struggling to pass your MRCP PACES? Are you frustrated, or feeling angry for not being able to pass your MRCP PACES despite all your efforts ? If you answered yes, then let me tell you that I know exactly how you feel, because I personally had gone through the same experience years ago. I have battled with my daily ward rounds, family life and so called ' bloody MRCP PACES exam' for months until I found a way to pass this examination. You're about to discover what might be the most powerful techniques to pass your MRCP PACES. Learn from other people mistakes and don't ever repeat these mistakes again!It's the same technique thousands of candidates, just like many consultants around the world used to pass this examination. If you ask them personally, they might not be able to answer you, but I have complied all these techniques in a book for you to read! And trust me, you will pass your MRCP PACES in ONE attempt if you follow these rules! I passed my MRCP PACES in two attempts but I will teach how to do it in just ONE try! If you are having problems passing your MRCP PACES, you must have used the wrong technique to study! You had passed your MRCP Part 1 and 2, there is no reason why you can't pass your MRCP PACES! Trust me, you have already acquired adequate knowledge to pass your Part 1 and 2, therefore there is no reason for you to fail your PACES! PACES is an easier examination compared to theory/basic clinical sciences in MRCP Part 1 and 2! If you are using the correct strategies, the victory is yours!
" Pass MRCP PACES in ONE Attempt ™ "
The Only Holistic System In Existence That Will Teach YOU How To Quickly Pass Your PACES!
" Pass your MRCP PACES in ONE attempt ™ " is a over 120-page downdoable ebook jam-packed cover to cover with all the secret you need to know about MRCP PACES. I will expose unique powerful techniques to organise your thoughts before you open your mouth during MRCP PACES! This ebook contains all the information you'll ever need to pass your MRCP PACES in ONE attempt! All mistakes made by candidates will be exposed in this ebook! Plus all the necessary information you need to pass your MRCP PACES! Limited time offer at 59.99 only! So What's the Bottom Line? How Much Does This e book Cost? And I have some great news for you! Since there are no printing costs for e-books, you can get this e-book for much less than it would cost if it were a hard copy manual - AND you get it within 48 hours . Your investment in this life-changing e-book is now only 59.99 ! "Right Mental Attitude for MRCP PACES"- FREE for YOU! The Only book in market that teaches you what kind of attitude you need to have to pass your MRCP PACES!
" 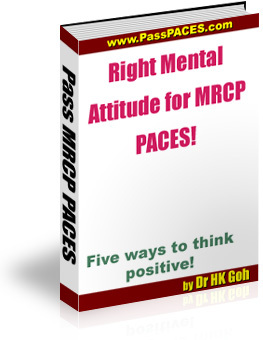 Right Mental Attitude for MRCP PACES™ " is a small ebook that teaches you 5 right attitude to face challenges in life including taking up MRCP PACES examination! This ebook is totally FREE of charge for you if you order my ebook "Pass MRCP PACES in ONE attempt!" NOW! This small companion ebook is a good book to start when you are down or sceptical about your future! Get this ebook NOW while stock lasts! Hold on , besides this ebook for FREE, you get another ebook totally FREE of charge! Yes, you are right! You pay 1 ebook price to get three ebooks in just US 59.99! 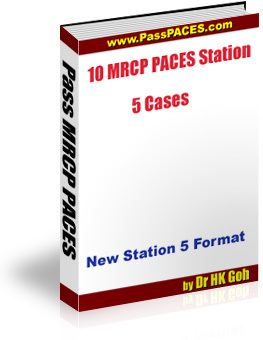 "12 MRCP PACES Station 5 Cases"- FREE for YOU! This tiny ebook illustrates 12 station 5 cases you will get in your MRCP PACES! Emphasis is put on how to approach these cases! This ebook is totally FREE of charge for you if you order my ebook "Pass MRCP PACES in ONE Attempt!" NOW! If you are not confident about this station, get this ebook and it will clear your doubt how to tackle this new station in MRCP PACES! Don't wait a minute to order at this low price! The regular price of the' Pass MRCP PACES in one Attempt ™ 'will be going up to RM299.99 after this introductory promotion is over. What other readers are saying about this PACES ebook! "Wow, this is a cool new ebook and I like it." "I think it's really great, which is an understatement. The price is really affordable, which seems to be a sound investment if you want to get your MRCP (UK) or MRCP (Ireland). I love this ebook and it explains the best strategies to pass PACES! I will recommend this ebook to all PACES candidates!!" "Never enter the examination hall without this ebook!" "So far , I have gone through only one fourth of the book.I find it helpful , practical and most importantly encouraging. I really appreciate your positive attitude and would recommend this book to my fellows who are also going for the exam. Keep it up." "I find the ebook good and useful! I want to print this out so that I can read it on paper!" I have almost read your book and found it very benificial as well." "Thank you so much for this beautiful and excellent ebook! I have finally found a useful book in the market that besides teaching knowledge but also motivating its readers!" "Thank you so much Dr Goh, you are my great teacher! I pass my PACES in single attempt!! Although it is quite expensive, I think it is a great investment for all PACES candidates!" "Your book is a precious for those who are sitting for MRCP PACES! I pass my PACES in oneattempt!! Once you place your order on Paypal secure server, the ebook will be emailed to you within 2 working days. Remember to include your email address during the purchasing process. The e-book is in PDF format, which can be viewed on any computer (PC or MAC). You can read it right on your computer screen, or you can even print out your own hard-copy. PS: If you do not want to pay via PayPal or credit cards, email me to know other ways ( Western Union and Moneygram) to buy this book! PSS: Malaysian candidates now can buy via CIMB, Public bank direct transfer, email me to know how!